In 2014, Stevie Nicks released "24 Karat Gold: Songs from the Vault," featuring new versions of demos she made over the last 40-plus years. That album was recorded in Nashville, and on Monday night, Nicks' 24 Karat Gold Tour came to Bridgestone Arena. For two hours, Nicks enchanted the crowd with her solo material and a few Fleetwood Mac favorites including "Dreams" and "Gold Dust Woman," both from 1977 masterpiece "Rumours." Some of the night's biggest cheers came during "Stand Back" when she broke into her trademark twirling, which, though perhaps slower than it was 35 years ago, was no less enthusiastic. Nicks accompanied her songs with stories from her career in rock music as well as the occasional prop: At one point, she came onstage in the cape she wore for her 1981 solo debut album "Bella Donna." Showing it to the crowd, she announced, "My mom was very frugal. She would say, if she was standing here right now, 'That was a very good choice in fabric...look at how long it's lasted.'" The Pretenders kicked off the night with an hour-long opening set that interspersed classic hits like “Back on the Chain Gang,” “Don’t Get Me Wrong” and “I’ll Stand By You” with songs from new album, “Alone.” which lead singer Chrissie Hynde recorded in Nashville; the record was produced by Dan Auerbach and features, among other local musicians, guitar great Duane Eddy. Hynde returned to the stage later for one of the night's highlights: she and Nicks sang “Stop Draggin’ My Heart Around,” a track that Nicks originally recorded with Tom Petty and the Heartbreakers. 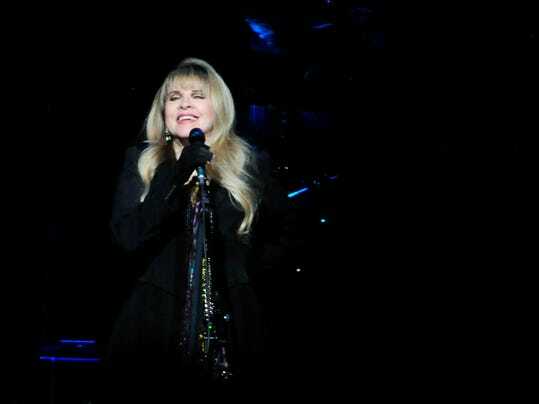 After ending the show with “Edge of Seventeen,” Nicks returned for a two-song encore: “Rhiannon” and “Leather and Lace." The latter, she said, was a song Waylon Jennings originally asked her to write for him and Jessi Colter. The country music couple didn't record it, but Nicks and Don Henley had a hit with the song 35 years ago. Earlier in the show, when reflecting on her lengthy career, Nicks gave Nashville's struggling musicians a pep talk: “Any of you out there who have come to this city of dreams… don’t give up… you just have to reach out there and get that star."